I realized at lunch the other day that you might have some misconceptions about my husband-to-be. I mean, based on the picture I've painted around here, I can understand how you might think he just sits around popping out diamond rings and bringing home tubs of chocolate chip cookie dough and taking me out for Sunday boat rides. But really people, he has flaws. Take the other day, for instance. He came home to a first-rate afternoon spread of cold gazpacho, white linens, plated silver, a shady deck, and an arugula test salad for the wedding and informed me without a trace of regret after just one bite that he Did Not Like It. He said it perfectly nicely, of course, but it reminded me that he does have a flaw. Somehow, he missed out on the bitter-flavor-appreciation gene. I first found this out over a bar of dark chocolate. I then rediscovered it over braised endives, a radicchio salad, and my cousin's Italian dandelion greens tossed with the most delicious green goddess dressing. The man can't stand to put anything even the slightest bit bitter in his mouth. He tells this story about when he was living in Vietnam, where he ate things like live, beating snake heart without batting an eye, about the time his host mom made bitter gourd soup—and he almost always, at least once or twice during the delivery, says he thought he was going to die. It's a little melodramatic, I think, but when I imagine the way I feel in front any quantity of tapioca pudding, I sort of see what he means. Some things just aren't meant to go down. The point of all this is to say that even though my groom didn't like the arugula-wheat-berry-cherry-tomato-Parmesan-lemon-juice-calamata-olive wedding salad, I think you will. The exciting part about it—and the reason we started experimenting with it in the first place—is that the wheat berries will be coming from Maine. We're trying to keep our dinner as local as possible, but for a time there, it seemed like an all-Maine grain side was going to be an impossible thing. Then of course enter Katy and my mother and their combined love of Heidi Swanson, and what seemed like a reach was suddenly a very real possibility. To that end, I'd appreciate any comments or variations or suggestions you might have on this. As you might imagine, I won't be hearing a lot at my table, so whatever goes on at yours, please, please let me know. This recipe is adapted from one Katy found on 101 Cookbooks. I ordered wheat berries from Wood Prairie Farm in Maine, and they have proven to be an excellent new addition to the grain cupboard. I changed things up a bit from Heidi's version—added fresh cherry tomatoes since we have them around in droves right now and went a bit heavier on the arugula—but for the most part, hers was a pretty fool proof combo. If you have something else nice you throw in, please let me know. I have a feeling that this version of the salad is just the beginning and there are endless directions in which we could go. Oh, and where the recipes—there's one for the salad and one for the arugula pesto that dresses it—where they say grated Parmesan, I mean made from a block of cheese with a grater, not the granular type you buy at the store. If you use that, you'll want to use much less as there's a lot more cheese per 1/3 cup. 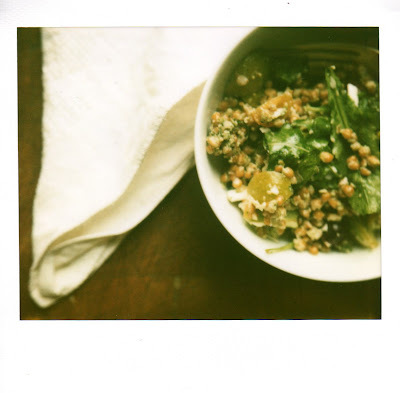 In a large serving bowl, toss the wheat berries, arugula, cherry tomatoes, and olives with the pesto. Once everything is well-coated, add the Parmesan, season with salt and pepper to taste, and toss lightly once more. Serve at room temperature. Combine everything in a food processor and give it a whirl. Keep going until the pesto is thick and well-blended. Season with salt, pepper, and lemon juice to taste. Glad to hear the fish monger still has the Hay Exaggeration Factor and is using it frequently in his stories. I wholeheartedly approve of this salad and I also happen to be counting the days until we eat it! 2.25 months, according to the CCM! Nothing has changed, Anna, don't you worry. And I'm glad someone approves. Are you endorsing this salad? "I'm Anna Pierson and I approve this arugula." Why thank you, dear sister! LOL! Your fiancee's reaction to the bitter melon soup made me laugh. Growing up in a traditional Vietnamese family, it was one delicacy that I could not acquire a taste for. However, I agree with you that not all bitter foods are created equally. 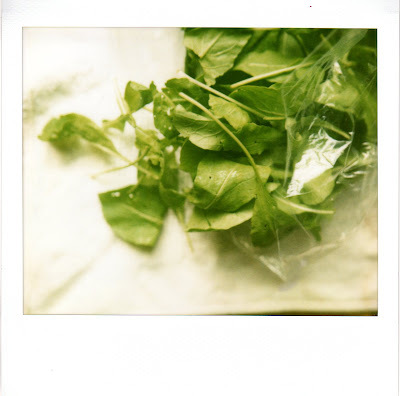 Your arugula salad sounds simple and delicious. It's good to know he's not the only one. I think I have literally heard him tell that story thirty times, and every time it gets a little more dramatic. Did you grow up in Vietnam itself or with a Vietnamese family in the U.S.? Alex wants very badly to go back there to visit his host family---hopefully, one of these days, we will be able to make the trip! It sounds from all his stories (excepting the bitter gourd soup!) like a wonderful place. I make a similar wheat berry salad with baby spinach instead of arugula and cranberries instead of olives. No pesto. It's yummy. I may try yours now to take care of my arugula emergency (finally a garden emergency this summer). That sounds absolutely delicious. I especially like the cranberry idea...maybe that will cancel out the bitter aversion for the fishmonger. i love heidi's cookbook -- i actually loved it so much i bought it and that is rare for me! congrats on the wedding! thank you, michelle! and yes, heidi does some pretty amazing stuff. i don't have her book, but i love clicking through the pictures and recipes on her site, and my mom is a big, big fan of hers. good stuff!